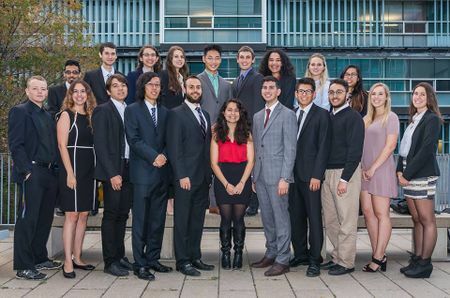 The Electrical, Computer and Software Engineering Student Society (ECSESS) is a student organization in the Department Electrical and Computer Engineering at McGill. ECSESS is dedicated to improving student life and making students time in McGill Engineering as memorable as possible. ECSESS strives to provide the best for ECSE students by representing them on the department and faculty levels. We’re also committed to addressing academic concerns, organizing challenging and educational activities. We make our home in Trottier 1060. Our lounge boasts a piano, game cube, foosball table and much more so come chill! For more information, please visit our website and Facebook page. Are you looking for an internship or a full-time job? Do you want to connect with the engineering industry? ECSESS offers you the opportunity to visit some awesome companies Candadian cities high tech industry. Companies in the past years included Shopify, Cisco, Ciena, Alcatel Lucent, IBM and more! Usually held in February, come join us and make connections and friends along the way! Twice a year, ECSESS hosts a pub in the basement of the McConnell building, in the common room. Come enjoy a beverage and a grilled cheese, try your hand at our die games and socialize with fellow engineers and friengineers. Banquet is held twice a year, in a nice restaurant. It is a nice opportunity to wine and dine with your fellow classmates (and sometimes profs) and to finish off a semester in high spirits! Curious about what your professionals and professors do? The industry and professor speaker series are a great way to discover their passions! Come hear them speak about their education, career path, research and interests. Our famous pancake breakfast run several times per semester, in mornings and provides you with delicious pancakes to fuel your hustles. We sell 2 pancakes for 1$ or 5 for 2$. Chocolate and maple syrup is free, but fruits and chocolate chips are 50¢ per 2 scoops. 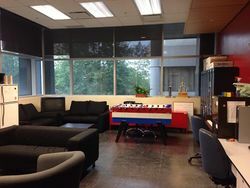 The ECSESS Lounge is located on the first floor of the Trottier building. It is open Monday to Friday from 10am to 4pm. During those times, a member of the ECSESS Council will be hosting office hours and is available to answer questions, sell tickets for events or stamp posters so that they can be put on the Trottier bulletin boards. Study rooms on the fifth floor in Trottier can be booked by students. Rooms 5103, 5014, 5015, 5106, 5107 are available on bookings.mcgilleus.ca, access with a Google account. Every room comes with a conference table and a blackboard with chalk. Room 5105 is the largest room and room 5103 is the smallest. The events committee is in charge of helping the VP internal organize CoffeeHouse, Blues Pub, Banquet, Pancake Breakfasts and Pub Crawls. The members of the events committee also volunteer for those events. The CodeJam committee is in charge of organizing and running CodeJam. The committee is part of the VP Technical Development's portfolio. Roles include food, logistics, swag, design, and others. ECSESS RoboElectronics is an organization aiming to teach McGill ECSE students basic hands on electrical and electronics skills. Through weekly workshops, they teach you everything you need to know in order to build and program your own autonomous robot. What’s more, an end of semester competition will tie everything in and allow you to measure your skills against your fellow classmates. By joining ECSESS RoboElectronics, you will gain: problem solving skills, the ability to work in teams in order to accomplish a complex task and, last but not least, technical knowledge not taught in class.